Shears are among the mostly used tools for gardening. This implement cuts with a scissor like action. Shears are mainly meant for trimming and maintaining the hedges. However, they are also found ideal for cutting joints. 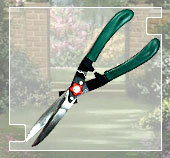 Similar to a pair of scissors, garden shears are ideal for almost any type of truncating activity in the garden. A typical garden shear usually possesses a pair of stainless steel serrated blades that intersect each other and are joined by a bolt. Made of durable stainless steel blades, shears have handles with comfortable and perfect grip. The handles are made of same material as that of blade, but are coated with brightly colored plastic. Plastic coated handles lend ease and comfort even in case of prolonged use. Garden shears are basically of three types, viz., pruning shears, hedge shears, and lopping shears. The functioning of these shears is perfectly in accordance with their names. The pruning shear is basically used for performing pruning or cutting activity on plants and trees; hedge shears are used for shaping the hedges and bushes, and the lopping shears are used for cutting unwanted stems and branches. The pruning and lopping types may seem alike in functionality, but the major difference between the two varieties is that, while the pruning shears are used for trimming thin stems, the lopping shear is employed for pruning thick stems.